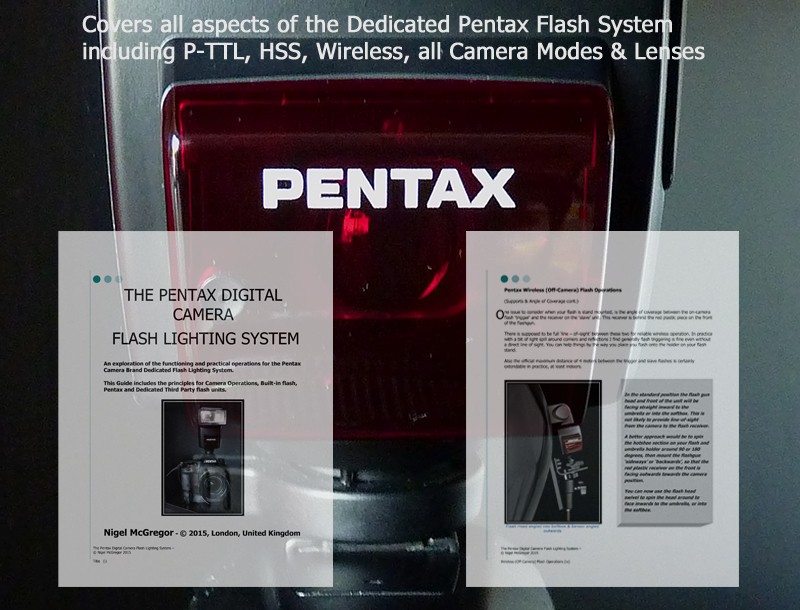 Thanks to John and the editorial team for helping me bring it to members right here on PU I have really enjoyed putting this together, and I hope it will prove helpful and informative for anyone who is interested in using Dedicated system flash with their Pentax cameras. You'll find that it covers most aspects of camera with flash operations, modes and techniques. Of course, the real point is that its about PENTAX FLASH ! No more talk about another brands system and pictures of the competition's equipment, which we see all the time in books on flash photography .This is all about OUR flash system and equipment. This is an evolving and developing project, and I am already preparing the 2nd edition which builds and adds to the current version, and that will be available in time. As always I see things here collaboratively, and value all your feedback, ideas, corrections and comments. 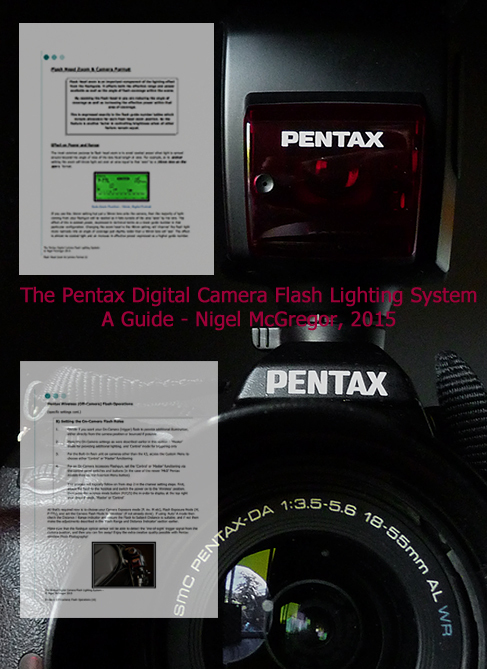 I hope with that help to maintain this as a definitive resource on flash with the Pentax system. Please download the guide and enjoy! You've certainly put a lot of effort in to this. I look forward to learning how to use my flash properly! Very useful. Thanks Nigel and the team. This is the sort of thing I hoped the website would work towards. Had a quick look and it looks a very useful guide, I've been looking forward to you posting this, many thanks for your hard work Nigel. Thanks again Richard, I always appreciate your appreciation. So now you've got all the info, we just need you kitted out with some flash gear ....all ready to shoot some SHOPKINS ! If you do a 3rd edition could you add a table of the features supported by the different models? It's obviously based around your hardware, but mostly very relevant to my hardware too. A quick look up of my 360FGZ's limitations would be helpful, and such a table should be very useful to those in the market for a new flash. I echo the praise for this publication Nigel, and if you do write a 3rd edition, I can loan you a AF160FC if you want 'hands on' and feel that it might be useful? Please PM if interested. Good suggestions Mike and John .... They will become part of the next version, thanks. 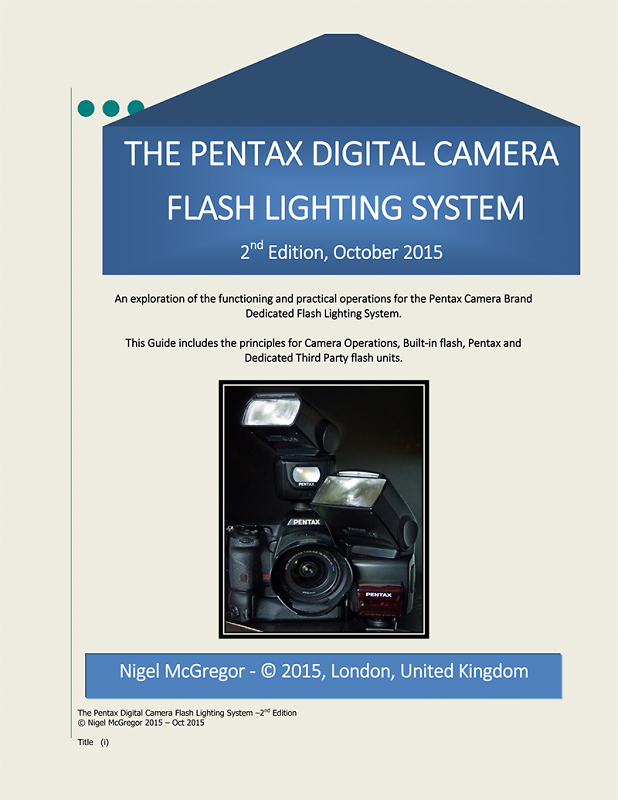 I can see the good use for a table of features; the Guide is essentially about understanding how the flash system interacts and functions on Pentax DSLRs, plus a good amount of 'lets put it all into practice and contexts'. But I want it to help people with their flash choices and understanding of the equipment options, so a table including the newer AF201, the older AF200, the ring flash, and the 4 '360/540' models now would be an excellent addition!